On Monday February 23, PayPal confirmed to Barriere Lake Solidarity (BLS) that the group’s account and funds had been restored. The news comes only four days after BLS activists learned that their PayPal account was under investigation due to complaints made by a member of the Canadian government. This victory can be credited to a successful social media campaign by BLS activists, community members and supporters, and to the strong support of the Quebec Public Interest Research group, who manage BLS’s finances. PayPal cited this successful social media campaign in their phone conversation with solidarity activists. For several weeks, BLS and the Algonquins of Barriere Lake (ABL) have been unable to access their PayPal account, containing funds raised for 23 ABL families going hungry just before Christmas due to non-payment of social assistance funds by a third party subcontracted by Aboriginal Affairs to manage distribution. For Barriere Lake, this represents a small victory in a long struggle for justice. The community recently filed a lawsuit against BDO Canada LLP and Hartel Financial Management and the Canadian government for harms incurred over 8 and a half years of Third Party (Mis)Management. Both companies have withheld or failed to collect information needed by Barriere Lake in order to get out of deficit and comply with federal regulations. ABL have subsequently been unable to comply with the First Nations Financial Transparency Act, since they assert that they cannot be held financially liable for funds over which they’ve had no control for years. 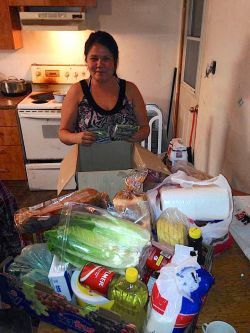 Members of the First Nation consider the exorbitant number of families cut off from social assistance late last year as further evidence of federal indifference to community needs. In the face of ongoing oppression and colonial fiscal relations with the Crown, Barriere Lake Solidarity and the Algonquins of Barriere Lake are celebrating this victory and preparing for the struggle ahead.